There are five aspects to Israel's crisis. From 70 AD (CE) until May 14 1948 the land was called Palestine (by the Romans) but there was no nation; the land was part of various empires. It was part of the Turkish Empire until becoming a British protectorate. During that time it was desolate and sparsely populated by Jews and Arabs and nomads. An Israeli born before 1948 might be a Palestinian Jew. It is possible be an Arab or a Jew born in Palestine. The land allocated to the children of Israel in Genesis 15 and Joshua 13 is many times the size of the current land of Israel. The Balfour Declaration designated a state with land on both sides of the Jordan, but by 1948, the land to the East was named Transjordan and set aside for the Arabs while the land to the West was set aside for the Jews and called Israel. After the declaration of the State of Israel, on May 14th 1948, the Arab League declared war on Jewish state, having ordered the Arabs to leave until the Jews and their state were destroyed. In this conflict the "mountains of Israel" (Judea and Samaria) were captured by Jordan. Their re-capture in 1967 led to them being called the "occupied territories". Refugee Camp - But these are Jewish refugees, dispossessed and driven out from Arab lands. Notice the optimism in this picture, in contrast to the propaganda pictures about Palestinian refugees. 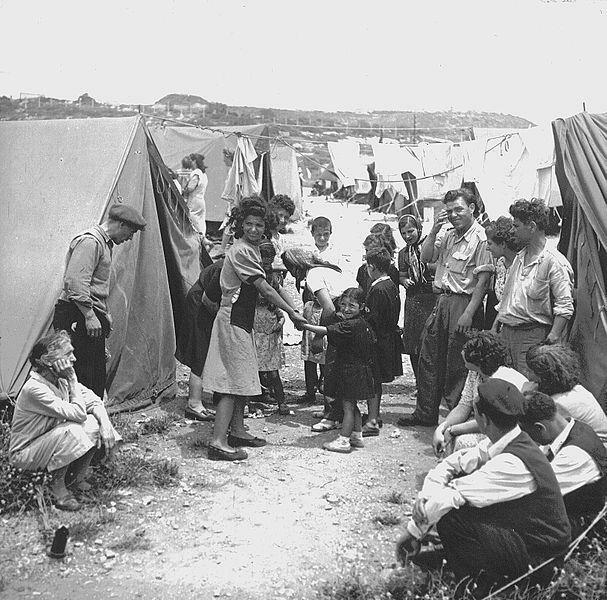 At the end of the 1948 conflict (in which Israel was not destroyed) there were about the same number of refugees on both sides. Israel absorbed the Jewish refugees, but the Arab nations refused to absorb their refugees, leaving them in camps as a political lever. (These Arab refugees started calling themselves Palestinians after the 1967 war). With 60% of Jordanians being related to these refugees, of course Israel felt these Arab refugees should go there. In 1964 the National Palestinian Council was recognized as international political state, there has been an issue that part of Israel should be designated for the use of these "Palestinians". But as we go on, How much of the Middle East should remain as Israel and how much should be Palestine? Now Israel has only Micronesia and USA as allies, and Israel is feeling very lonely and betrayed. Israel is now an international pariah, but how close is the situation of Zechariah 13 v3 . . . . "all the nations gathered against Israel?" This is very dangerous. Don’t forget Israel is a nuclear power. Clearly, Israel is surrounded by hostile Arab and Islamic Nations, which are ideologically committed to the removal of Israel from the (Arab / Islamic) Middle East. But what friends does Israel have in the world? The United Nations is dominated by a multitude of Arab/Islamic states, which use the UN as a forum for turning world opinion and pressure against Israel. Oil dependant nations dare not jeopardise their economies by antagonising Israel's oil rich enemies. Europe is oil dependant, and has a very large Muslim immigrant population; as well as a history of anti-Semitism. Russia has a classically anti-Semitic history, and has aspirations of renewed world influence among Israel's enemies. The United States remains the only significant nation on Israel's side! But. How good a friend is the USA? Protection of Israel, military support and supplies, comes second to defence of America's wellbeing. Israel could be sold out to help the USA and friends extricate themselves from Iraq, Afghanistan or wherever. Bush's envoy, Condoleeza Rice spoke of Mahmoud Abbas as a champion of freedom , by comparing the struggle of the Palestinians with the Civil Rights movement in the USA! With friends like that, one has little need of enemies. Israel is being delegitimised around the world by the BDS campaign. Much of this originates in Britain. Accusations of Israel being an Apartheid state are popular in universities and among "progressives". Most of the world's media is left leaning and hostile to Israel. Over 60% of Israel's GDP comes from America. Over 65% of GDP is spent on defense. Historically, 20% of GDP comes from tourism and now there is none! Average individual credit debt is three and a half year’s salary. Israel is a major exporter in three industries – Software, Agriculture, Light Engineering - mostly to Europe. 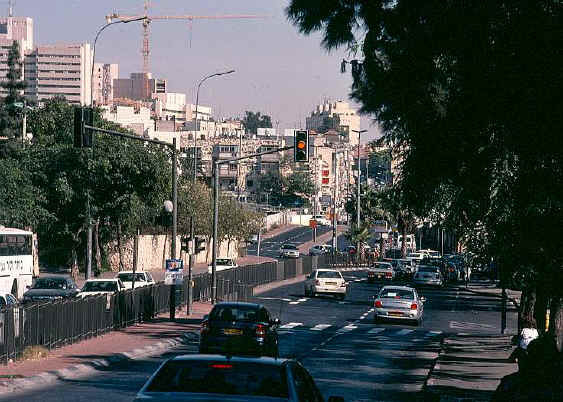 Since the renewed upsurge in terrorism in 2000 the economic situation has made life desperate for many Israelis and cheating and crime have soared, making life even more difficult. Until recently, much of Israel's labour was Palestinian and now this is not readily available. Now Chinese and Romanian labourers have taken over but the withdrawal of visas has led in many cases to exploitation, slavery and manipulation. Additionally since we have had the rise of many political parties representing community groups and religious groups. This has led to 35% of the Knesset being dominated by the religious parties, and some religious people do not even believe in the existence of a state of Israel until Messiah comes. At the founding of Israel, the Sephardim were poor while the Ashkenazim were literate, civilized and wealthier and dominated politics. But over three generations since the birth of Israel, Ashkenazim with minimal birth-rate have diminished compared to the Sephardim, with six or more children who now dominate in the proportional representation form of democracy used in Israel. Proportional Representation doesn’t work well in Israel because the religious Jews now dominate specific areas of the country rather than being evenly spread and forming a government is only possible by making alliances with minor parties in order to build a workable majority. In the event of a crisis these minority parties often take advantage of their position, destroying the government majority, leading to a new general election. These factors work against strong, stable government and are a disaster for the State of Israel. In late 2003 Dovish left wing (opposition) politicians negotiated a peace formula with Palestinian politicians, which became known as the Geneva Accord. The plan is largely a rerun of their thoroughly discredited Oslo Accords of 1993. They are undeterred by the Palestinian’s failure to keep their side of the agreement and their "intifada" terror assault which started in 2000. One would expect the initiatives of opposition politicians to be widely disregarded, but western leaders appear happy to encourage the undermining of the democratically elected leadership of Israel. This is probably the biggest crisis of all and the most distressing. Leaving aside the conflict between Jews and Arabs, there are feuds between the Ashkenazi and the Sephardi Jews and the religious/secular groupings. There is also tension and resentment between the olim (immigrants) and the sabras (Israel born) Jews. Not all Jews believe in God! The secular Jews outnumber the religious, and the religious are divided into a spectrum ranging from ultra-orthodox though orthodox, to liberal and nearly secular with groupings within each band. Then there are the Messianic Jews (Jews who believe in Yeshua (Jesus) as Messiah). The Messianic Jews seek to reach out to the land in prayer and loving support, but are hated by the orthodox sects, many of whom have political power to oppress them. Religious freedom is guaranteed under Israel's constitution but Messianic Jews could be prosecuted for spreading their faith, under laws which have not so far been applied. The infighting among the Jews in Israel is terrible, yet this is the land of promise. Jews are sympathetic to the suffering of the ordinary Palestinians and many seem to believe the media version of the conflict, and feel guilty about it. The Jews of faith who recognize the legitimacy of their right to be in the Mountains of Israel are viewed as extremists. Some ultra orthodox believe that the state of Israel should not exist - that it is for Messiah to establish Israel at his coming. The Left in Israel is vocal and unhelpful to Israel's credibility in the eyes of the world. There is crisis in the lack of national unity. The crisis of identity is even worse - who are we - what are we - do we have a right to exist. Opinion is deeply divided, at home as well as abroad, about the rightness of the military action against Palestinian Terrorism. The Israelis are clearly not the bloodthirsty bullies they are portrayed as and their forces take much greater personal risks in avoiding collateral damage in their missions than do the USA and other western forces. One major argument is that the military option does not work; that it only promotes retaliation and the so called spiral of violence. This argument is very popular in the west. But do the facts support this argument? At the beginning of October 2003 the "Intifada" had been raging for three years. Operation Defensive Shield started to fight back eighteen months into this period. Although civilians are still being killed on the streets of Israel the hard data justifies Defensive Shield. During October 2001 to September 2002 Palestinians killed 449 but in the year ending September 2003 the figure was reduced 47% to 240. The month before Defensive Shield commenced saw 134 Israelis killed but this death rate has been reduced to a third. The withdrawal of troops or scaling down of operations so often called for have all resulted in a surge in terrorist attacks, and the famous Palestinian "cease-fire" (hudna) of August 2003 resulted in a higher than average Israeli death toll. In every case, military restraint has been exploited by the terrorists - it has never been reciprocated. Quoting from a Jerusalem Post article by Evelyn Gordon. See also Sderot and Missiles in particular reference to Gaza, following Israel's Disengagement. There have been Christian churches in Israel since the first century CE. There are Arab churches, Orthodox churches, Catholic and Anglican churches and free churches. Many churches are still locked into Replacement Theology. Some charities, such as "Christian Aid" have a highly political, anti-Israel stance. Many Christians form their world-view from the media (see Israel in Today's World ) and are, consequently, praying and working for the wrong things. However there is a large and growing movement which could be called Christian Zionists or wild olive Christians. This phenomenon is not from any particular church but is springing up across the churches as God reveals the significance of Israel. The International Christian Embassy in Jerusalem, and its Feast of Tabernacles celebration provides a focus for this movement. A march through Jerusalem is held as part of the feast as a gesture of love and support from Christians from the nations. Many Israeli Jews now see the evangelical Christians as their only reliable friends outside Judaism, and are deeply appreciative of the new mutual understanding. However some Jews fear that evangelical Christians are only interested in supporting Israel and assisting Aliyah as part of the hastening of the return of their Jesus. They resent the idea that Christians may be looking forward with relish to apocalyptic events which include the death of half the Jews as merely a step towards their own goal. (See towards the end of the prophecy of Zechariah for the problem words). However, a survey of evangelicals actually found that a large majority are concerned for Israel out of a conviction that it is their duty, that they are grafted in to Israel (not the nation) and that the blessings and curses pronounced for the Patriarchs of Israel still apply. "will you be part of the remnant, an overcomer who will be separated to Him?" So check out your heart. Where are your loyalties and your priorities? Do you stand with Israel, or with her enemies?